Allergen-specific immunotherapy (AIT), also known as desensitization or hypo-sensitization is the only causal desensitizing therapy for allergic diseases. The average duration of the therapy is between 3 and 5 years. Even though AIT has good success rates, the therapy is sometimes not effective or suitable for the patient. A great disadvantage thereby is that therapy success is apparent at the end of the therapy, i.e. after the patient has passed through the treatment procedure. Furthermore the patients often have allergies against several allergens; one treatment cycle can however include only a limited number of allergens. A prediction method for an individual patient’s therapeutic response to an allergen-specific immunotherapy at an early stage of treatment would allow changing the therapeutic strategy and would be a great advantage for the patients. Here a straightforward and easy method of predicting the therapeutic success of an allergen-specific immunotherapy (AIT) in patients suffering from or having a disposition to develop an allergic disease is offered. The relevant parameters can be determined from nasal sample material at an early therapy stage and thus be used to decide whether or not to continue with the allergen-specific immunotherapy and predict whether the AIT will be therapeutically successful. 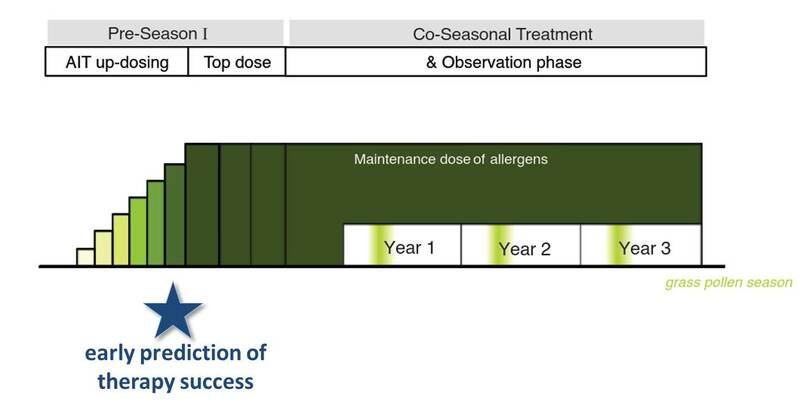 Figure: Duration scheme for allergen-specific immunotherapy (AIT) for grass pollen allergies: The duration of treatment for grass pollen allergies is 3 years. Now an early predition of the therapy success within the first pre-season-treatment period is possible. An early prediction of therapy success is a breakthrough for allergen-specific immunotherapy, as it is economic and patient-friendly. Early prediction saves enourmous costs and enables the termination of the treatment procedure at an early time point and the application of another therapy scheme if the first therapy is predicted to be not successful. A possible commercialization strategy is to offer kits for predicting therapeutic success. Those kits could be offered together with allergen preparations.